Jerome is the stunt flyer of the Super Wings team. He knows every dance style and often teaches others fun dance moves on the hit preschool Super Wings show. He is a born entertainer, enjoys the spotlight and loves to compete with his friend Jett. But whenever Jett needs help, Jerome is always there for him! Jerome transforms from toy airplane to bot in just 10 easy steps! Collect all of your favorite Super Wings team heroes for new adventures around the world! 28 to collect: Jett, Dizzy, Donnie, Paul, Astra, Mira, Agent Chace, Jerome, Flip, Todd, Bello, Grand Albert, X-ray Jett, X-ray Dizzy, and X-ray Jerome and more (each sold separately). 5" Transforming Jerome toy is made for preschool Super Wings fans ages 3+. This Super Wings World Airport Collector Pack features fan-favorite characters from Season 1 including 2" Transform-A-Bot scale: Jett, Dizzy, Paul, Donnie, Jerome, Mira, Grand Albert and Bello from the hit preschool Super Wings show. 2" scale transforming figures - Transform from vehicle to bot in 3 easy steps. Each character transforms differently. Mini-figures - Includes Jimbo, Bob, Joey, Roy, Larry, Sammy and Silvia. Transform-a-Bots are made for preschool Super Wings fans ages 3+. Jet is young, confident, and really fast on the hit preschool Super Wings show! He is positive, full of curiosity and never hesitates to try new things. He gets along with everyone at world airport and he loves to travel and deliver packages to kids around the world. Jett transforms from Toy airplane to Bot in just 10 easy steps! 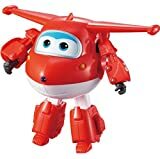 5" transforming jett toy is made for preschool Super Wings fans ages 3+. Paul is a policeman with a strong sense of duty on the hit preschool Super Wings show. In fact, he's so enthusiastic that he acts like a policeman even when there's no policing to be done! Within the Super Wings team, he's known as being quite playful and silly. Paul transforms from Toy police airplane to Bot in just 10 easy steps! 5" transforming Paul police toy is made for preschool Super Wings fans ages 3+. Jett's Takeoff Tower 2-in-1 toy playset transforms from 12" long Jett plane to over 23" long airport playset. Inside is an airport full of adventure just like the Super Wings show! This Super Wings set features 4 fan-favorite characters in the 2" transform-a-bot scale: Jett, Paul, Mira and Grand Albert. 2" scale transforming figures - transform from vehicle to Bot in 3 easy steps. Jet - Young, confident, and really fast! Jet is confident, positive, full of curiosity and Never hesitates to try new things. He gets along with everyone at world airport and he loves to travel and deliver packages to kids around the world. Paul - the policeman among the Super Wings team with a strong sense of Duty. Paul is so enthusiastic that he acts like a policeman even when there's no policing to be done! Within the Super Wings team, he's known as being quite playful and silly. Mira - even though she's an airplane, Mira likes water more than anything in the world. She's at her absolute best when underwater and she's great at diving deep under the sea. This Super Wings toy figure set features 4 fan-favorite characters in the 2" transform-a-bot scale: Donnie, dizzy, Jerome, and bello. Donnie - known as the engineer of the Super Wings team, Donnie is loyal, good natured and with his tool kit, he can fix almost anything! Donnie is a Genius when it comes to inventing things to solve problems. Dizzy - a pink rescue helicopter, dizzy is always ready to save the day. Even though she's the smallest member of the Super Wings team, she's incredibly strong, and the go-to helicopter when jett is in trouble. She always knows exactly what to do when a problem arises. Jerome - the stunt flyer of the Super Wings team. Jerome knows every dance style and often teaches others fun dance moves. He is a born entertainer, enjoys the spotlight and loves to compete with his friend jett. But whenever jett needs help, Jerome is always there for him! Time for a Super upgrade! this set includes two transforming vehicles: paul's cruiser as seen in the hit preschool Super Wings show and 2" scale transforming Paul figure. Paul is a policeman with a strong sense of duty. In fact, he's so enthusiastic that he acts like a policeman even when there's no policing to be done! within the Super Wings team, he's known as being quite playful and silly. Paul's police cruiser - easily transforms from 7" tall Super robot suit to police cruiser vehicle with collapsible decorative light-bar and real working wheels. 2" scale transforming Paul figure - transforms from vehicle to Bot in 3 easy steps, has real working wheels and easily fits in the cab of the police cruiser vehicle. Paul's police cruiser and 2" transforming Paul figure are for preschool Super Wings fans ages 3+.